Good morning to all my frieds and fellow bloggers. If you arrived here by chance I do hope you like what you see and come back for more. Please leave a comment and if you have an active blog I will return the favour. Once again it's time for our little club to make another Christmas card. We make a card every other week, and I can't believe we are half way through the year. Where have the months gone? Sylvie is our host this time and she wants to see cute cards. I am posting my card a day early becasue I have another project scheduled for tomorrow. I'm afraid I don't know where the image is from. It has been in my Christmas digi folder for a very long time and never used until now. I'm sure it was a freebie from somewhere. I diecut the snowflakes from white card, sprayed with adhesive and then drenched with baby blue glitter. Unfortunately it doen't show too well in the picture. Brilliant image making a fantastic Christmas Card, I just LOVE it. Sweet card - I need to crack on with mine! Totally adorable card Christine! It's perfect! A lovely card - such a sweet image and I love all the glitter too. Visiting today with my DT hat on, so thank you for joining us at the Rudolph Day challenge. Beautiful Christine, I love the image that you've used. I love snowmen and these are perfect. Lovely card. The image is so cute and I love how the snowflakes are hanging from the ribbon bows. OH these little snowmen are so cute, asuper image and a lovely card. Magical festive card. Love the "snow" you have dotted on the image. ooooooooooooo! I love this fantastic card. Those snowmen are just the cutest. Now I always call Sue J the pearly dots queen, but I think you are catching up now with this. This is so very cute! I like the tower of snowmen and your pretty design. The added snowflakes falling is a lovely touch. Lovely and cute xmas card, the image is adorable and love your colour choice. Just came back to say I really like the way you did your snowflakes. Must try to remember that. Me again...my goodness, I did not realize that my blog name or my name does not list on yours. This is my 3rd comment so think I had finally better say...Crafty hugs from Maureen Scrappymo! 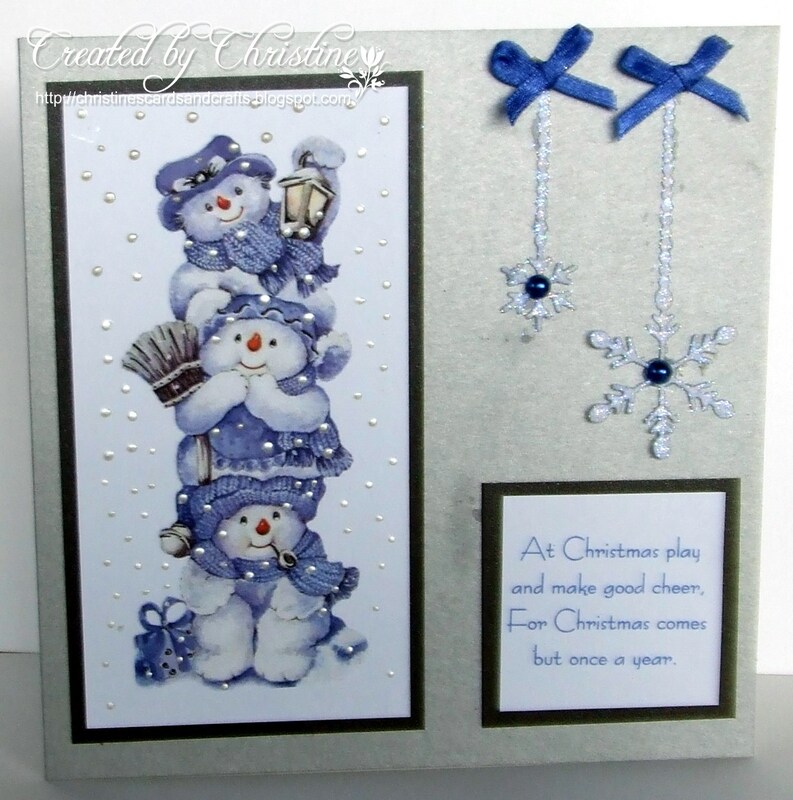 A beautiful frosty card with the cutest snowmen ever! Love it. Very cute and adorable. I love the colours. Hugs Mrs A. Beautiful Christmas card. Love the sweet image. Oh what a fabulous image and love the choice of the blue, a perfect Christmas card.